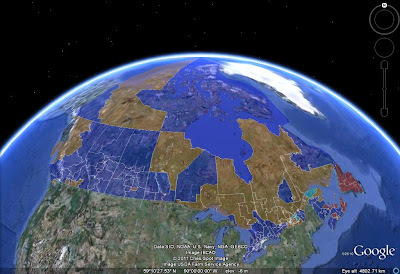 The regional breakdown for today's Angus Reid poll has now been posted. 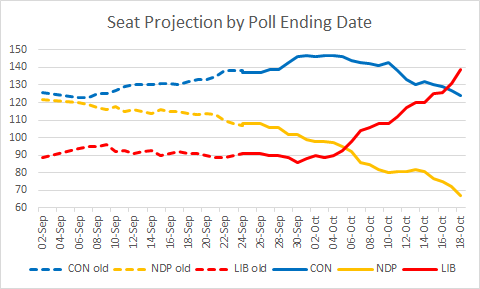 The 7-point Tory lead in Ontario is in line with recent polls, but the 24% for the NDP there is almost 10% above what other surveys have shown. 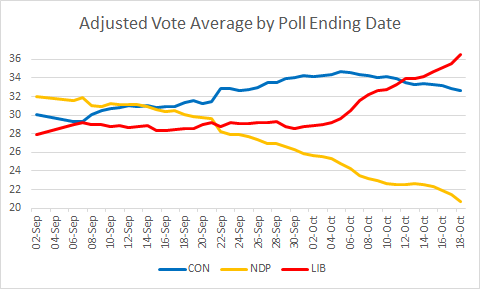 In BC, the Conservatives are 30% ahead of the Liberals (and 18% ahead of the NDP) - we can be pretty sure that the truth is somewhere between this number and Nanos' 3.6%. Finally, in Atlantic Canada, the Tories are in third place, well behind the Grits and Dippers; this is probably just a statistical blip. One thing I haven't mentioned is that the Greens are doing poorly: just 3.4% in today's Nanos and 5% in the Léger and the Angus Reid. I now have them at just 5.5% nationally, which is only four fifths of their 2008 result. Again, stay tuned for the Harris-Decima update and hopefully for the Léger (and, if we're really lucky, Forum) regional numbers.